Ok so my 2nd cousin used to live in the old mansion on Oregon St. When my late great aunt Barb went to stay there she got slapped hard on the back. But that was like 2 or 3 years before I went there. When I went I didn't really have any experiences except for this constant feeling of being watched, a weird cold feeling and I heard two or three footsteps on the stairs. Finally if anyone ever goes to the H.B. Gillis house or just happen to move in and you have any questions you can email me at (nickxcx @gmail. com). PS the picture I posted is a picture I took while I was there. In the bottom right window I think there is the apparition of H.B. Gillis. But my cousin who lived there thinks it was a girl apparition. And I know what you are thinking 'o it's probably a person' well I can prove it was not a person because everyone else was gone and we being me, my mom, and my cousin had just exited the house . 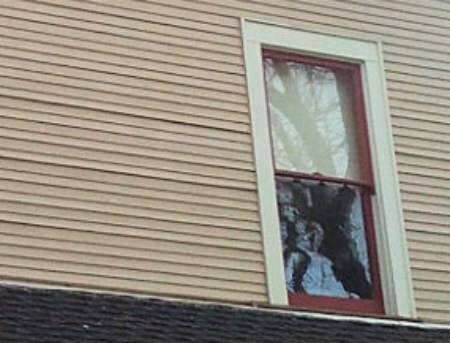 I live in Yreka and I can attest that I've seen the woman in the window. The house was built in 1895 and has a tower facing the Main Street. I've seen the ghost in the window of the tower. I grew up in Yreka and always loved that house. A classmate and his family lived there then. I was a former owner of Gilli's Mansion. Mr. Gilli's was main problem. Also there was a vortex in Cuppola. Erik Berlin's did two clearings. Originally Gilli's wife and sisters were there also. Ladies left, but Giles came back. My sister and I are empaths. We pick up on energy through dreams. We both got impression of what Mr. Gilli's looked like although we have never seen any pictures of him. He is tall nice slightly wavy salt and pepper hair with mustache. Perhaps he wore spectacles. He always wore a 3 pieces suit dapper. He liked women too much. His wife was very depressed. This place also has built though form of repressed feminine energy. My psychic friend in Mount Shasta felt the place was dead. There were masses of flies in the attic and couldn't find the source. This is not a healthy place for people to live. One lodger was thrown downstairs. It is on the market now. It really should just be demolished. .